Sen. Ted Cruz (R., Texas) and his wife were heckled and harassed at a Washington, D.C. restaurant by protestors on Monday night. The Twitter account "Smash Racism DC" tweeted out a video of protestors confronting Cruz by his table with chants of "we believe survivors." As Cruz and his wife were leaving the table, one protestor yelled that his opponent, Rep. Beto O’Rourke (D., Texas), was "hotter" than him. Another shouted a questions about whether Cruz would vote his "best friend" Judge Brett Kavanaugh to the Supreme Court. "God bless you, ma'am," Cruz says amid the shouts. He also told protesters to move so his wife could leave. BREAKING. Activists just chased @TedCruz out of a fancy Washington DC restaurant, chanting "We Believe Survivors!" The account tweeted an additional video of a protestor identifying herself as one of Cruz's constituents. She said she was a survivor of sexual assault and wanted to know how he will vote on Kavanaugh. Kavanaugh has faced two allegations of sexual misconduct that, according to the accusers, occurred decades ago. Christine Blasey Ford told the Washington Post that Kavanaugh, then a junior in high school, attacked her when they were at a party in Maryland in the early 1980s. The other allegation is from a woman named Deborah Ramirez who accused Kavanaugh of exposing himself at a dorm party during his freshmen year at Yale. This isn't the first time Republican public officials have been harassed in public. Secretary of Homeland Security Kirstjen Nielsen was confronted by protesters in a Mexican restaurant near the White House and had to leave. Senior White House Adviser Stephen Miller was yelled at as he ate at another Mexican restaurant in Washington, D.C. White House press secretary Sarah Huckabee Sanders and several family members were at the Red Hen restaurant in Virginia and were asked to leave by the restaurant co-owner Stephanie Wilkinson. When asked why she told Sanders to leave, Wilkinson told the Washington Post that Sanders works for a "inhumane and unethical" administration. Senate Majority Leader Mitch McConnell (R., Ky.) and his wife, Secretary of Transportation Elaine Chao, were confronted after leaving an event at Georgetown University. These incidents sparked a national debate about civility and how citizens should protest the Trump administration or policies they disagree with generally. Rep. Maxine Waters (D., Calif.) encouraged voters to to "push back" on Trump administration officials and tell "them they’re not welcome anymore, anywhere." O'Rourke denounced the protesters in a Tuesday morning tweet. "Not right that Senator Cruz and his wife Heidi were surrounded and forced to leave a restaurant last night because of protesters. The Cruz family should be treated with respect," O'Rourke said. Not right that Senator Cruz and his wife Heidi were surrounded and forced to leave a restaurant last night because of protesters. 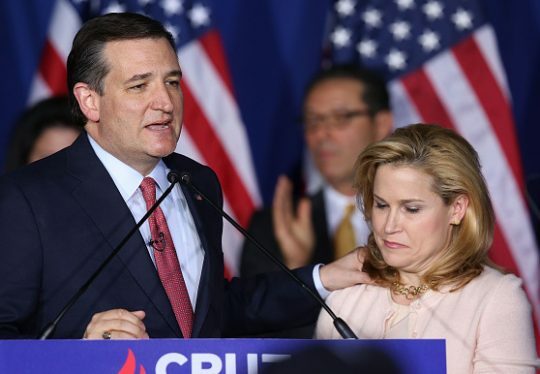 The Cruz family should be treated with respect. The restaurant where the Cruzes were eating, Fiola, also released a statement late Tuesday acknowledging "protesters entered Fiola with the apparent purpose of confronting one of our guests." Fiola said the patrons were able to return to finish their meal after "the situation resolved." UPDATE 9/25/18 10:48 a.m.: This post was updated to include O'Rourke's tweet. 9/26/18: Updated to include statement from restaurant. This entry was posted in Politics and tagged Beto O'Rourke, Protests, Ted Cruz. Bookmark the permalink.